On November 1st, my wife and I had our annual opportunity to spend a couple of weeks on Grand Cayman. We were able to take a friend and his wife along with us this year, and introduce them to the wonders of the reef at Grand Cayman. Unfortunately, winds were very high (25 to 30 mph) for the first few days that we were there, and it was very difficult to find good snorkeling, even on the downwind side of the island. On Wednesday afternoon the winds started backing off, and for the rest of the trip, conditions were ideal. We were able to snorkel all of our favorite spots, a few other good spots, and a couple of new spots. We snorkeled at Eden Rock a couple of times during the week. Eden Rock is great because there is plenty of wildlife and humongous, ancient coral structure that rises up 30 or 40 feet from a sandy bottom. The cruise ships park just off from the coral structure. 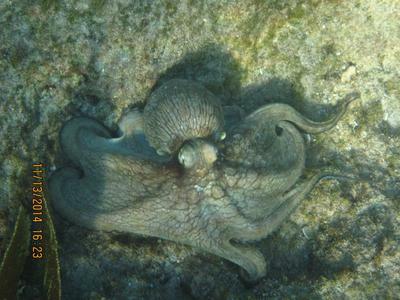 This is where the octopus photo was taken. North of Eden Rock, on the other side of the bay, is Hamburger Reef, which has huge coral formations, also. This is also where the wreck of the Cali is, and always has interesting fish and wildlife hanging around. Heading further north, several miles up 7 Mile Beach, we were told to go to the Christopher Columbus Resort for some good snorkeling. It was OK, but just a little further up is Cemetery Beach, which is one of our favorite spots. The reef is smaller and is OK, but the beach for an after-snorkel lounge is as good as it gets. There is a lot of wildlife around Cemetery Beach, and it is a regular spot to see turtles. We got some good shots of turtles. See one above. This year, conditions were right, so we took advantage of being at Cemetery Beach and swam out to the Kittiwake, which is a 200-300 foot ship that was sunk about a half mile from shore to create structure. It hasn't been there very long, 3 or 4 years, so coral growth is minimal on the hull, but there is tons of wildlife around it. We saw a man-size snapper hanging around the ship, and a very big Midnight Parrotfish. There was also a very large school of Horse-Eye Jacks. Heading the other direction, going east along the south shore, we snorkeled out to the reef at Smiths Cove. This is always a nice spot in that the beach and location is very nice, shady, and picturesque. We were able to witness a wedding while there relaxing after a long snorkel. If you swim along the shore at Smiths Cove in either direction, there is ironshore structure that is home to interesting wildlife and coral. A little west of Smiths Cove is a snorkel spot where the Blue Parrot used to be (wiped out by Ivan in 2004). There is a small resort at this location now, and we spent our second week there. We snorkeled here several times this trip. Then, a little east of Smiths Cove is South Sound Cemetery. This is a nice spot with sand and shade where we have snorkeled many times over the years. There is a no name ship wreck here that provides ample structure for wildlife and coral, and we always see many interesting things here. This is also where the cruise ship tenders park, so if you go here when no cruise ship is in, the small bay is empty. Continuing east, a new spot that we tried is called Spotts Cemetery Beach. This place is very shallow with not much in the lines of coral. There was not much wildlife and it seemed to be a favorite swimming spot for locals. We were told we would see turtles here, but we did not see any. We will relegate Spotts to a place to go when winds are bad and you can't get in anywhere else. Further east, just on the west side of Boddentown, is a spot that we have tried to snorkel for years, but the waves were always too big and rough every time we tried to get in there. It is at the end of Beach Bay Rd. This year we were successful. We were able to get in, but alas, found the snorkeling to be rather average, at best. There was wildlife to see, but it was rather shallow with not much coral. Probably the most interesting aspect is the cliff that is at the water's edge to the west of the beach. We found that it was too shallow to be able to get in too close to the cliff, and high tide would most likely be the best time to give it a try. The beach is very nice and usually deserted, with a few palm trees for shade. On the east side of Boddentown is a drift snorkel that is a pretty good swim. Not as good as along the north shore, but certainly worth it for a change of pace, or when winds are out of the north. Go in at Governor Russell Public Beach and go with the current west and come out at the Turtle Nest Inn. This was a nice swim with lots of fish and wildlife, and adequate hard and soft corals. Heading a little further east, we decided to get a change of pace and went out on a snorkel boat at Ocean Frontiers. They took us to 3 reefs that are all kind of close to each other, but really too far from shore to be able to swim to. The first is called Sunrise, the third was called Sunset, and I forget what they called the middle one. There were 6 of us snorkeling with one guy taking us around. Small, relaxed, and a very nice afternoon for the cost. They have a nice sandwich and drink spot at their location where we had a snack and a drink after our snorkel excursion. As you head further east and the island turns and heads to the north, you come to Colliers where we stay at Morritts Tortuga for one week each year that we come. The snorkeling here is excellent, but it is a big area and you have to travel around to find the good spots. There is a wonderful soft coral forest somewhere in the middle, and it usually takes us a while to find it, but it is worth it. There is all kinds of wildlife around to view, and we almost always find things that we have never seen before, or we seldom have opportunity to see. If you want to see lots of fish, snorkeling around the dock bar at Morritts is packed with fish. This is where we saw the Blacktip Shark that is pictured. 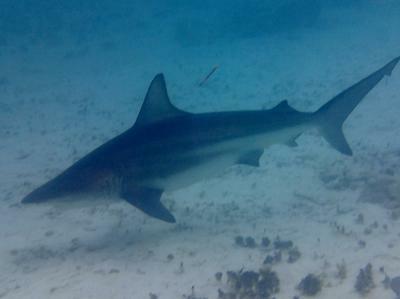 This shark was about 5 feet long and was certainly intimidating. The attached picture is not enhanced at all, regular lens with no magnification and he filled the screen completely. If I thought that I could run, I would have. 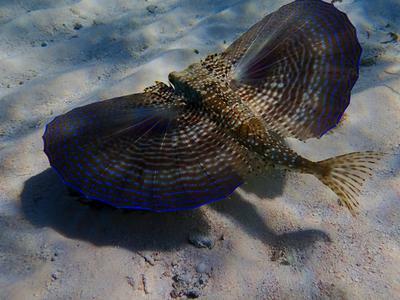 Out away from the dock, and just swimming around viewing the sights, is where we came across the Flying Gurnard that is pictured. This was the biggest one that we had seen, at least 12 and maybe 14 or 15 inches long, which I guess is getting up to about as big as they get. It didn't seem to mind us following it and taking its picture, in fact, it kind of gave us a show. We also saw a Bandtail Puffer in this area, which is the first time we had ever seen one of them. Rolling up the east end of the island and turning to the west, as you go along the Queens Highway, you pass several good snorkel spots that we were not able to take advantage of. After a few miles, you come to Connally's Cove, which is a piece of private property that the owners apparently don't mind folks accessing the water from. It is a beautiful shaded spot that we have enjoyed many times over the years, a favorite. The snorkeling here is great. There is lots of interesting old coral structure with a lot of live and vibrant hard and soft coral and lots of wildlife. It is certainly better during high tide so that it is not so close to the surface, but even during low tide, you can still work your way in and around the lanes and fingers that are part of the stand. 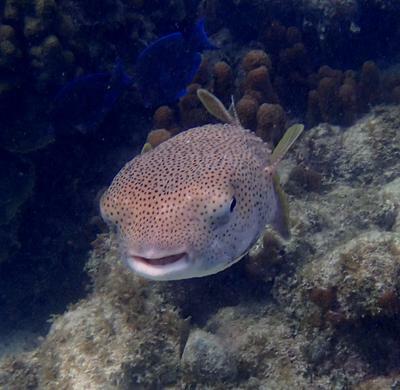 This year, I came across a Porcupinefish that, for some reason was not timid. You almost always see a little bit of these fish as they hide under some structure and watch you, but this one came out to greet me and hung around and let me get some great shots of him. Here is one. Heading further west, one of the best drift snorkels that you will find in Grand Cayman is from the Sea Lodges to Rum Point. We did this three times while we were here this year. The first time was right after the winds had died down, but the currents hadn't slackened yet. Whereas we will spend 2 or 3 hours swimming around and taking in the different types of coral and structure, from out near the barrier reef to in near shore, the current was so strong this time that we were down to Rum Point in about 45 minutes. We rushed by so much stuff along the way (not because we wanted to), and the current was strong enough that you really could not go back to look at anything. The next 2 times that we did it, the current was minimal and clarity was great and we really had a wonderful, meandering trip down to Rum Point. 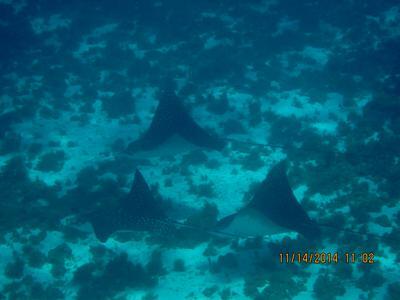 We saw a formation of Eagle Rays (picture below). We also came across and got some good photos of a Balloonfish, which is the first one that we have ever come across. This area also has a vibrant, growing stand of Staghorn Coral that is about as big as I can ever remember seeing. This is a wonderful area and when weather and winds are favorable, this is one of the best spots on the island for seeing natures wonder at it's finest. Please read the next comment for the remainder of this post. As you roll around the tip of the island into the area known as Cayman Kai, you come to Starfish Beach. There is no coral and not a whole lot of wildlife to view, but the starfish are the draw and you will always see dozens of various colors of Cushion starfish. Whenever we have friends that come along with us to Cayman, we always wind up at Starfish Beach at some point. Who can resist an orange starfish? In closing, I would like to say a bit about the food to be had on Grand Cayman. One of the reasons that we love to go there is the fish. We eat fish for dinner every day while we are there, and if you go to the right spots, you know that it is fresh and locally caught and is helping the local fishermen. Snapper, wahoo, barracuda, ocean trigger, grouper, we have even seen grunts on a menu. There is a small place on the southwest side of West Bay, called the Heritage Kitchen that prepares great fresh fish. You order at a window, and sit at a picnic table, but is good food and very reasonable. In Old Man Bay, just south of the intersection of Queens Highway and Franks Sound Rd., is a place called Kurts. Good fish, good prices, very local cuisine. Just around the corner, heading to Rum Point is Over The Edge. Great fish, you can even try a turtle steak from the turtle farm, decent prices, and a great patio over the water to have your dinner. Make a reservation if you want to eat on the patio, though. We love to vacation and snorkel in Grand Cayman. We will be going back in March, 2015, but this will be our last trip staying at Morritts Tortuga. We gave up our timeshare there, so we won't have the definite draw to the island, but we hope to be able to continue to go there on an annual basis, staying in private locations as we find them over the internet. We also have a trip to Bonaire planned for the fall of 2015, and we will see if this is able to develop. Appropriate postings will follow. Thank you so much for your very detailed and thorough report. We have visited Grand Cayman a few times on a cruise ship and have snorkeled Eden Rock but have been unable to find info on other places to snorkel from shore around the island. This report will surely be useful if we visit again. 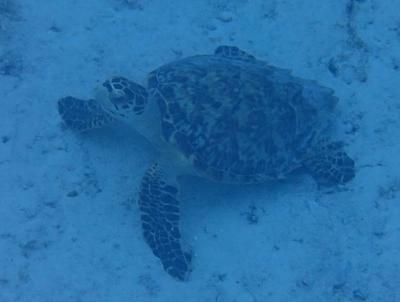 Hi Susan, Tom & Jan have 4 more similar stories about Grand Cayman snorkeling. You can find links to them on this page, along with a number more stories by another avid visitor Cary. Hope you have a great time next time in Grand Cayman! Tom & Jan, very informative post. I will be in Grand Cayman for the day 3/18/15. Have been here twice before on cruises for the day and snorkeled all the stuff around the cruise terminal (Eden Rock, Cheeseburger, The Wrecks). I plan to rent a car this time. If you were there just for the day, based on conditions, where would you spend 3-4 hours if it was rough, and if it was calm? I just got back from 10 days in Bonaire and snorkeled the entire island. I travel solo, so I booked exclusive time with a guide for 8 out of the 10 days including night snorkels every night. Bonaire is my 10 in the Caribbean. I can tell you more specifics if you want. Look forward to your answer. Gerry, to answer your question, without a doubt I would do a drift snorkel along the north shore with Rum Point as the final destination. When you rent your car, have them show you the best way to get to Rum Point. About a mile, mile and a half before you get to Rum Point, there is a small collection of apartments called Sea Lodges. Park here, walk through the Lodges to the beach, go in and lollygag your way back and forth between the barrier reef and the shore until you get to Rum Point. This is a good place to come out in that you can relax in their chairs, get a cold drink and consider the wonders of nature that you had just experienced. We were there one time when the wind was really too strong and the current really swift, and we were down to Rum Point in about an hour (it was actually difficult to try to swim against the current to go back to look at something). Then, we have been there when the current felt almost non-existent, and we spent almost three and a half hours winding our way back and forth before reaching Rum Point. Near the end of the swim, there is a great stand of Staghorn Coral, one of the best that I have ever seen, but sometimes we can't find it. 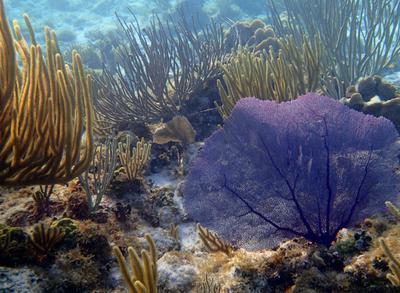 Also, along the way you will go through great stands of hard and soft coral that competes with what you see in Bonaire. If there is a wind coming out of the north the day that you are there that is 15 mph or more, then I would probably head for the south shore. The south shore has some pretty good snorkeling, but it doesn't compare with the north shore. If you head south out of Georgetown, in a mile or two you will come to Smiths Cove. There is pretty good snorkeling here either direction along the shore, and then out quite a ways to the buoys. The coral at the buoys is really for divers, so it is kind of deep, maybe 40 or 50 feet. But the water is clear and you can still see lots of sights. Following the main road a little further south/east, there is a small beach at the South Sound Cemetery. No one really goes here to snorkel, we have only ever seen one other couple snorkeling here in all the times that we have gone here, but there is a wreck that sticks out of the water and the snorkeling around it is quite entertaining. It can be a little shallow here, but if it is windy out of the north, I like this spot. Then, if you head way east, to the other side of Boddentown, there is as good of a drift snorkel as you will find along the south shore. Go in at Governors Beach, which is a small public beach right along the main road and is identified by a sign, and swim west with the current, back and forth between the shore and the reef, and come out near the Turtle Nest Inn. As it turns out, if you were going to be there a couple of days earlier, we would meet you and take you on a tour. We will be there from March 7th through the 17th. We have been to several Caribbean islands, and agree that it is tough, probably impossible, to beat Bonaire in the Caribbean. 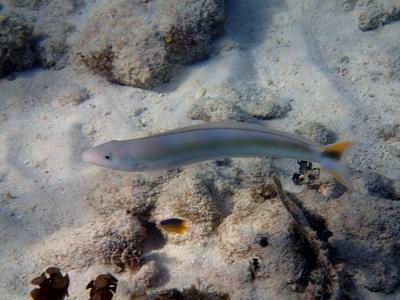 But Grand Cayman has some wonderful snorkeling if you get out around the island and away from the main tourist areas. Enjoy your day. Great stuff! We'll be making our 4th trip to Grand Cayman near the end of March and staying at Morritt's. We really enjoy that place! Typically our snorkeling has involved the beach at Morritt's, Cemetery Reef and Rum Point. I'll definitely use some of your other snorkeling and dining suggestions... Thanks! Tom thanks for the info on Rum Point. I went there solo on 3/18/15. I rented a car at the cruise terminal, so it was about an hour drive. I went to Rum Point and dropped off a towel, hat and flip flops under a tree on the beach. Then, I drove down to Cayman Kai and parked. There was a private property sign but I don't think that applied to the parking area. I walked through the complex and got in off the dock and immediately saw a ray. The weather was perfect; hardly any current at all. I snorkeled in and out of the shallows for about 2 hours while drifting down to Rum Point. This might be the most pristine reef conditions I have seen. The coral is in great shape, and there was a good variety of fish. I found 2 Staghorn Coral forests closer to Rum Point, the second larger than the first. There were good critters inside of there. Out of my peripheral vision I saw a silver torpedo coming at me from the deep side. It was a barracuda that stopped suddenly and pulled up about 10 feet from me. I had never seen that aggressiveness before; pretty cool. I was really far out from the dock at Rum Point. It took me about 20 minutes to swim in, but no problem. My stuff was still there. I had a smoothie in one of the bars and started walking back to the car. A guy in a truck picked me up along the way and took me to the car. Then I drove back and dropped off the car. It was a great day. Thanks for the advice.